Email sent from Erowal Bay resident to Office of Shelley Hancock. This email thread raised the issue of ongoing speeding traffic in Erowal Bay. I acknowledge that the original email has been forwarded to the Area Command Superintendent last week and to date there has been no action. Additionally, refer a conversation with your office (Mathew, 09:20, 23rd APR 18). The past weekend, saw further speeding traffic in Erowal Bay and on Naval Parade. In fact, on Saturday my wife and another local resident of Erowal Bay were standing on our front verge when a vehicle turning onto Naval Parade from Second Avenue started fishtailing and speeding down Naval Parade. Both my wife and her friend took photos of the speeding vehicle at which time the driver conducted a U-turn and then started to abuse and threaten my wife and her friend before driving off. My wife contacted the Nowra Police to report the incident and approximately three and a half hours later the police arrived at our property to discuss the events as they had occurred. The Police have also acknowledged that Erowal Bay is known as a speeding problem area but their hands are tied as there are insufficient resources to combat this issue. Notwithstanding, the Police did want to pursue the verbal treats and requested that my wife and friend attend the station to make a statement. Understand that my wife was concerned and shaken with the threat but for several reasons decided not to make this statement. Most being that there was no assurance that there wouldn’t be any repercussions from the offender and his friends and family and that the continued issues of speeding and anti social behaviour be addressed. We tried to explain to the police that the issue here was the traffic management in the area. They advised that they did not have the resources to conduct traffic management in the area. They further advised that this was the responsibility of the HWY Patrol, which needed higher level tasking approval. I know that there have been complaints from several residents of Erowal Bay to the police regarding the speeding and anti social driving but on all occasions they have said to come to the local member. In an effort to curb this behaviour, I only ask that the police patrol and use a speed radar at random times. Although the predominant time of the offences occur at 5:30 am, 08:00, 14:30, 16:30 and anytime at the weekend. 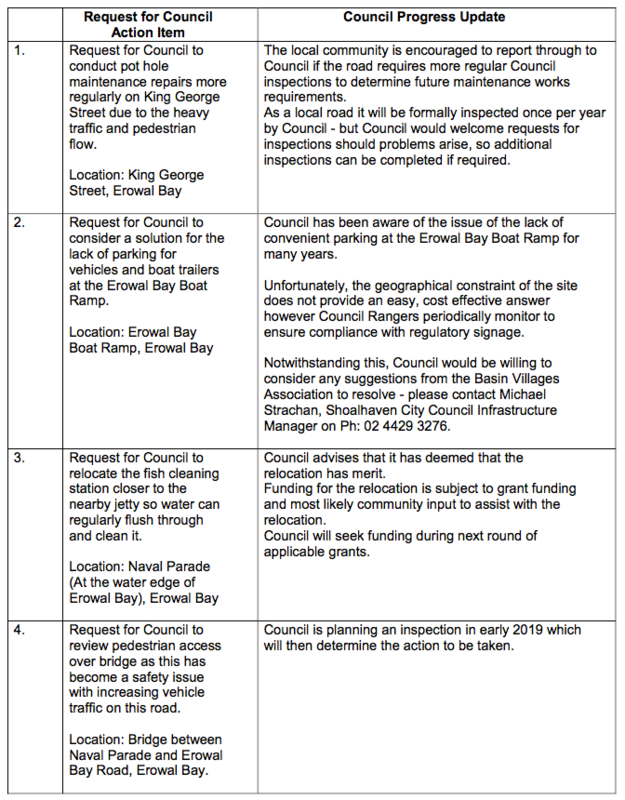 For my part I will continue to try and generate interest from the locals and attend the Basin Villages Forum on the 21st May in the hope of getting this issue raised with the view to look towards some permanent and fixed traffic management controls. I do not have any confidence in the Shoalhaven Council as an Erowal Bay home owner we continue to pay rates but have never seen any funding allocated to footpaths in the area. Please note, some time ago I raised this with a Councillor who suggested that Erowal Bay home owners create and action group like Huskisson and fund it themselves! My response is what happens to the money raised from my rates and the ongoing rate rises (how transparent is the current process)?? 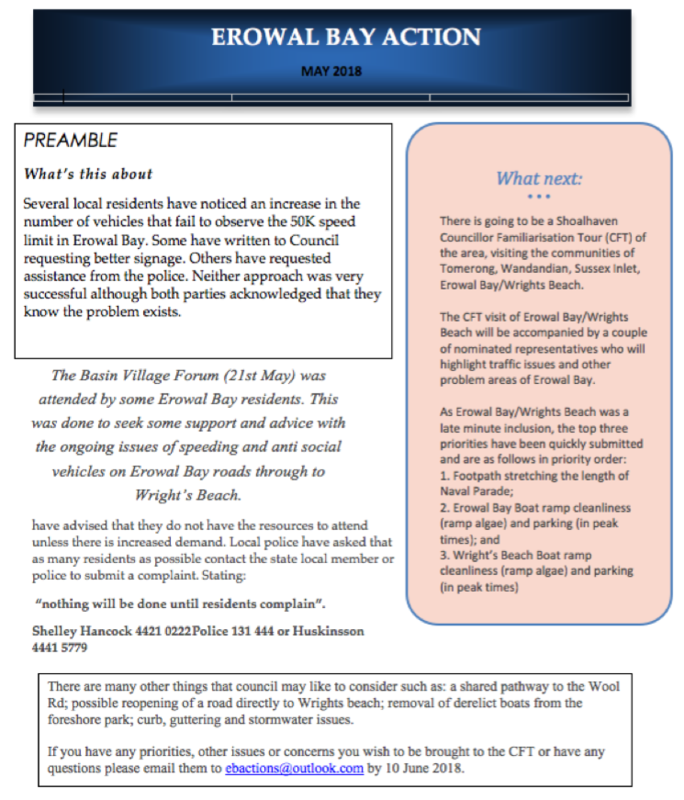 Erowal Bay Road is the only way to get to three separate communities which also home two caravan parks, yet no one of authority wants to address the issues or even attend the area.